In my lifetime I have seen many seemingly insignificant things cause great trauma and pain, often at catastrophic levels. This time, over it doesn't people died because of a monkey! Now let's back up a little—At least 20 people are dead after a pet monkey was unleashed on girl by a group of three men. Vengance prevailed over reason.The girl’s family sought revenge after the girl was bit and scratched. They succeeded— all three men were killed along with the monkey. It didn't stop there. Things took an even more brutal turn. The chaos descended on the city of Sabha, Libya, and many more were killed when it resulted in tribal clashes. Bader al-Daheli, a civil activist, said that the two main tribes, Awlad Suleiman and Gadhadhfa, are each backed by armed groups. 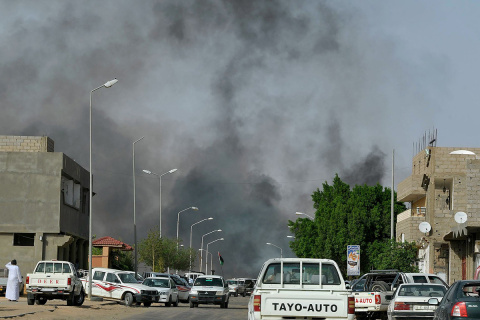 Abdel-Rahman Areish, the head of Sabha hospital, said 20 people have been killed and 50 wounded. This is really how it happene: The monkey pulled off one of the girls’ head scarf, leading men from the Awlad Suleiman tribe to retaliate by killing three people from the Gaddadfa tribe as well as the monkey, according to a resident who spoke to Reuters. City officials could not be reached to confirm the accounts. You may not believe it, but that monkey attack—resulted in a full scale battle. ‘There was an escalation on the second and third days with the use of tanks, mortars and other heavy weapons,’ the resident told Reuters by telephone, speaking on condition of anonymity because of the denigrating security situation. In a delicate balance of power founded on a very thin line between hate and peace, the Gaddadfa and the Awlad Suleiman represent the most powerful armed factions in the region. Attempts at peace have so far crumbled. During the latest clashes, which took place in the city center, initial attempts by tribal leaders to calm the fighting and arrange a ceasefire so that bodies could be recovered had failed, residents said. Since 2011 much of the country Libya is effectively ruled by a patchwork of local or tribal militias. You can see how much lawlessness prevails— a monkey attack was able to cause the deaths of so many people and shatter an already fragile peace.